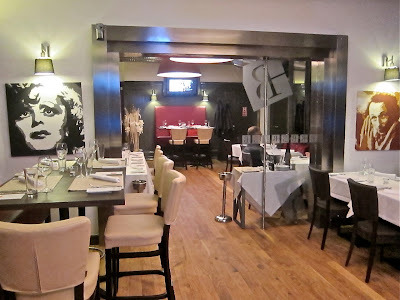 I rarely return to write about restaurants for a second time. This is one of those times. I last wrote about Bílkova 13 in the summer of 2011. Back then, it was a relatively new restaurant specializing in Italian and international fare. I didn't fall in love, but I generally liked it. Earlier this year, this restaurant with its address in its name got a makeover. It was already going for a high-end crowd. Now it's aiming a little higher. Bílkova 13 reopened this fall with a revamped menu and a somewhat different look. Restaurants are always changing their menus, and I don't revisit many, but the photos of their new dishes on their Facebook page enticed me back. Even though it closed down for a while for reconstruction, I wasn't struck by many big differences in the interior. The bar area was lighter and brighter. The same goes for the middle dining area. Tables were covered with white tablecloth. 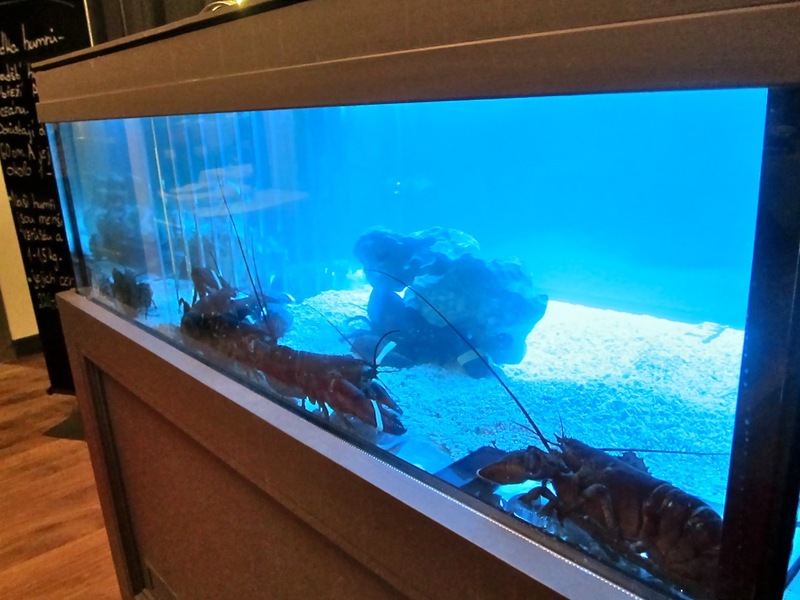 There's a live lobster tank there. In the large main dining area, the lights are now kept much lower. It's a big restaurant, so even with a fair number of diners, it only felt about half full. 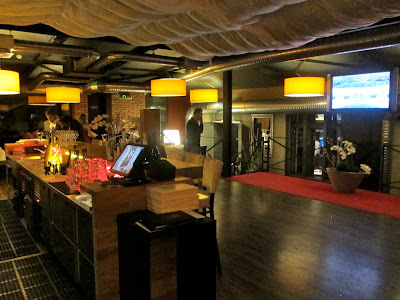 They had a live piano player one night to boost the atmosphere. He was pretty good if you like that kind of thing. 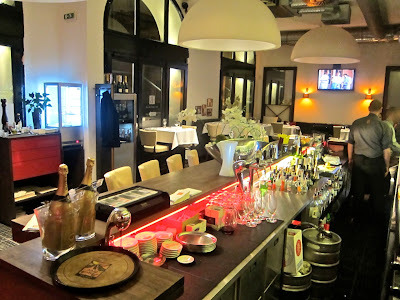 I arrived with Miss P. She had a glass dry Prosecco (65 CZK). I tried a very nice Malbec rosé (110 CZK). We later shared a large bottle of Perrier (130 CZK). 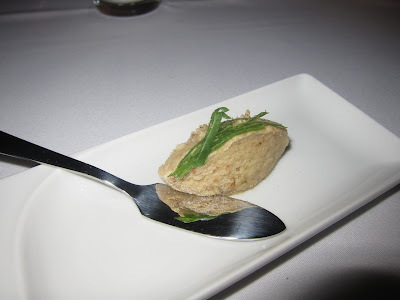 We received an amuse bouche the waiter called a "savory pork pâté." It reminded me of sádlo, or pork fat, but a little smoother and with fancier presentation. It's not Miss P's kind of thing, so I got both portions. 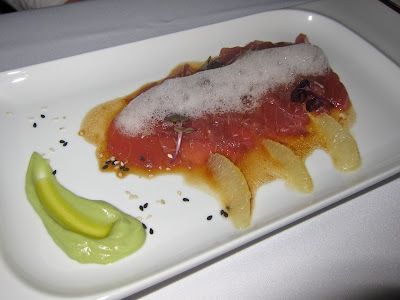 She ordered the tuna ceviche in ponzu with avocado puree and lemon mousse (220 CZK). This was a fine looking and fresh piece of fish. I wouldn't call it a ceviche since the dish leaned more toward salty than citrus. There were wedges of what tasted like pomelo on the side. We found it enjoyable, though quite small, and it was gone too quickly. I had the beef tenderloin tataki (264 CZK). The lightly seared, super tender beef with a char-grilled exterior sat on a sweet soy sauce mixed with pumpkin oil and sesame. 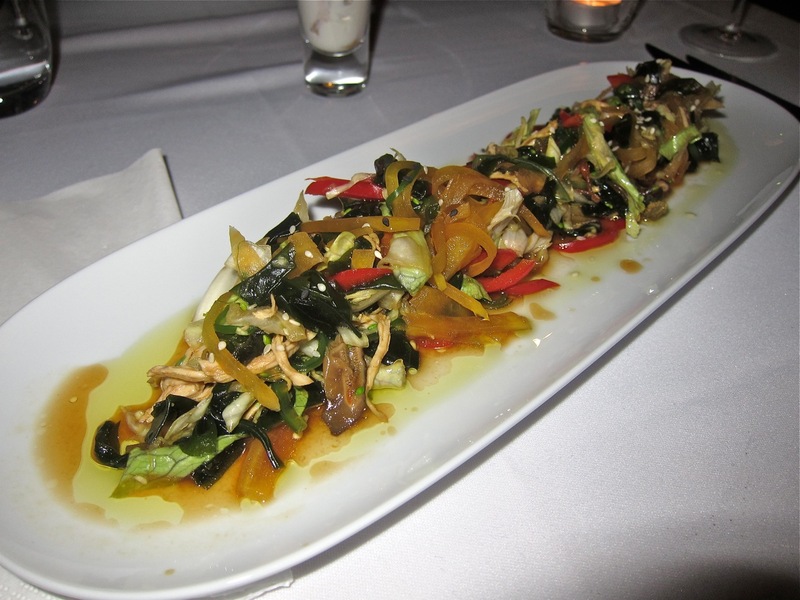 There was small seaweed salad on the side. We both thought this was delicious and perfectly prepared. Although small, I found it more satisfying than the tuna starter. 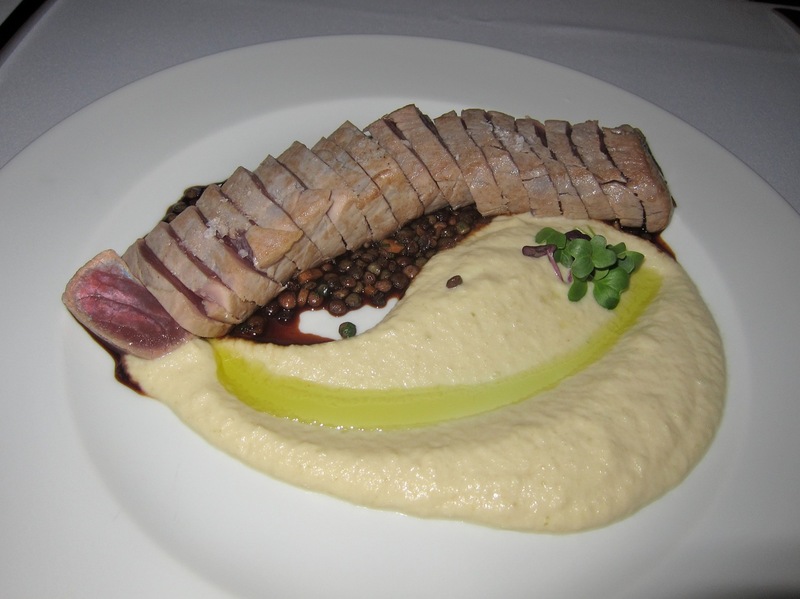 To further satiate her tuna craving, Miss P got the seared tuna steak (459 CZK) for her main course. We emphasized how rare we like it, and they did it just right. It was also a generous portion. The tuna sat on lentils and a lovely, sweet Madeira wine sauce. On the side was a creamy celery root puree with a splash of olive oil. This plate was judged a success. Miss P also ordered a side of mixed vegetables (124 CZK). This was not a regular menu item, but the waiter helpfully asked what types of vegetables she wanted and came out with a flavorful mix she was very happy with. 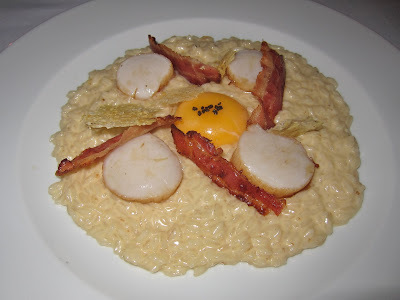 I got the risotto with scallops, pancetta chips, egg yolk, and cheese Grana Padano (340 CZK). The yolk mixed in with the bacon and thick, creamy rice and produced a deliciously decadent mixture. I dabbed it sparingly on the delicate, perfectly seared scallop. I thought it was wonderful fall comfort food for people with a little room to spare in their arteries. I was in the mood for dessert and was surprised there were no chocolate choices. 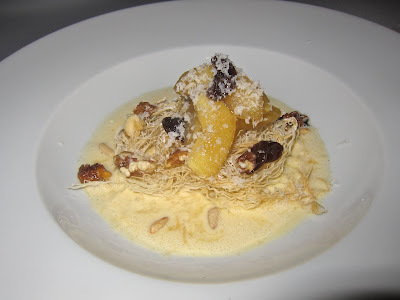 So I went for the caramelized apples with cinnamon and raisins (140 CZK). The apple rested in a vanilla cream with shredded pastry and pine nuts. I liked it, but some might find it too sweet. 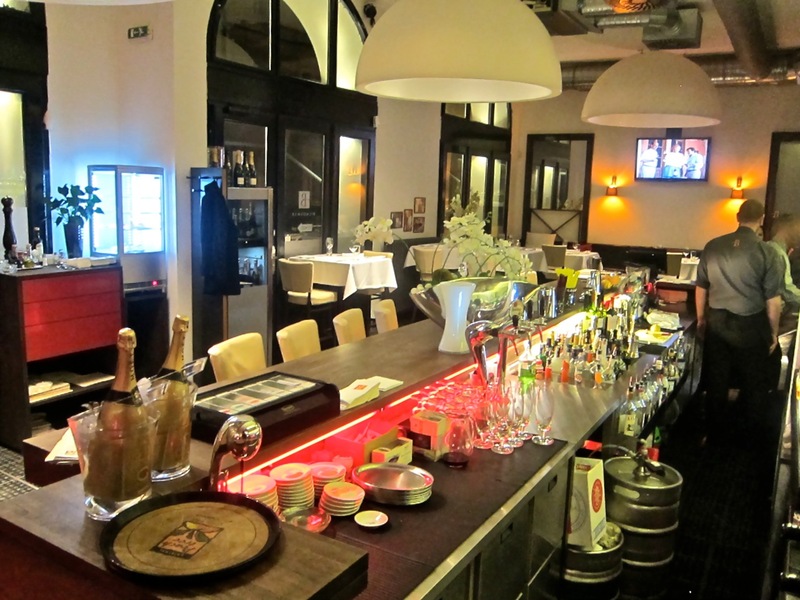 Miss P had an enjoyable cafe macchiato (55 CZK). The service was a mixed bag. Our waiter was generally efficient, but he had a stony and terse disposition. There were also lapses. Our amuse bouche plates remained on the table for half the meal. The bill for this dinner was 1908 CZK before tip. We enjoyed the meal and looked forward to returning the next week. This time, the amuse bouche was a glass with olive oil, sage, and pesto sour cream with bread sticks. This didn't work well. 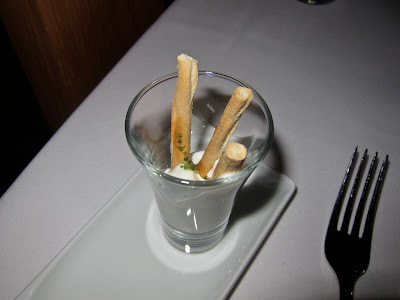 The bread sticks got soggy and mushy in the cream. We were celebrating, so we ordered a bottle of Mailly Brut Rosé Champagne (1230 CZK). They were having a special discount on champagnes this night. We loved its dry and subtle, fruity character. 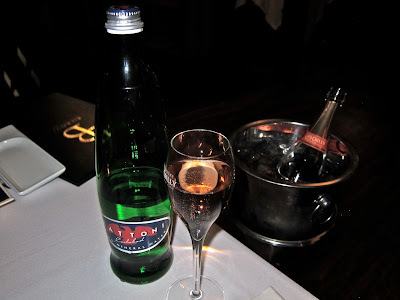 We also had a large bottle of Mattoni mineral water. Miss P started with half a dozen oysters (600 CZK). They were as good as can be, large and meaty and refreshing. 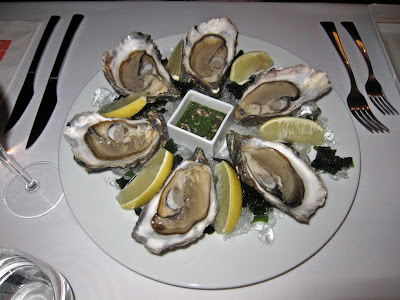 They were served with lemon wedges and a variation of a mignonette sauce with chives. We tried to find out exactly what kind they were. After a long wait, the waiter told us they were Bretons, but that's all we could find out. I had the B13 Salad with chopped chicken, sesame, shitake, ginger dressing, seaweed and cucumber jelly (179 CZK). This didn't really work for me. Everything had been soaking in vinegar for too long. There were a lot of red and yellow pepper slices and not enough chicken. It was too sour and too limp. 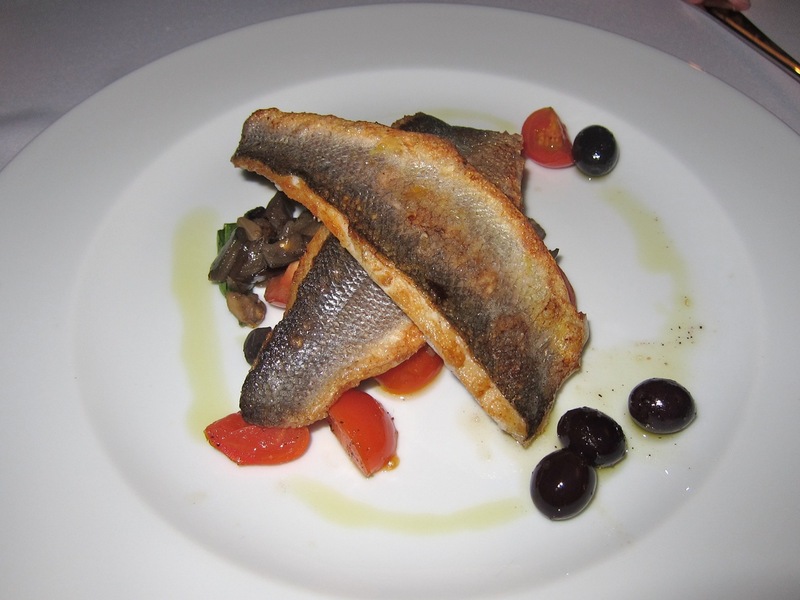 Miss P got the sea bass fillets (379 CZK). The fish was light and pristine -- the best sea bass I've had in a while. 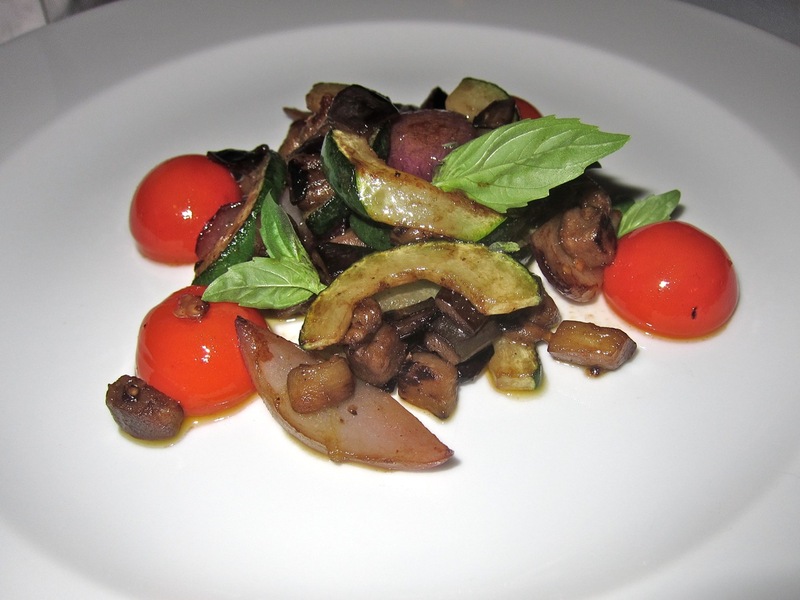 It sat on a tasty sautee of eggplant with some quartered cherry tomatoes and whole black olives. The menu said it came with a sauce vierge, which is chopped tomato and basil with lemon juice and olive oil. I didn't really taste that. 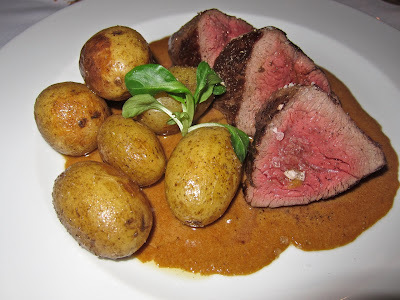 I decided to go for one of the most expensive items on the menu: The filet "mignon" with Albufera sauce (760 CZK). I asked for it medium rare and it came out just right. The sauce was a rich combination of foie gras, cognac, cream, and beef drippings. The flavor of the Argentinean steak was good, and it was not tough at all. But it was not as tender as I'd expect from a South American filet. 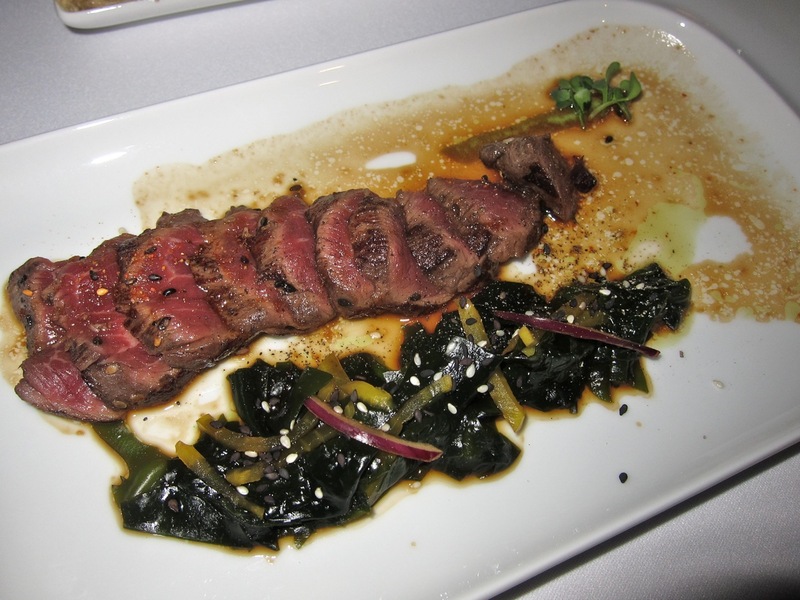 The beef tenderloin starter was, in all ways, superior. This dish seemed to be more about the sauce. I liked it, but not enough to justify the price. 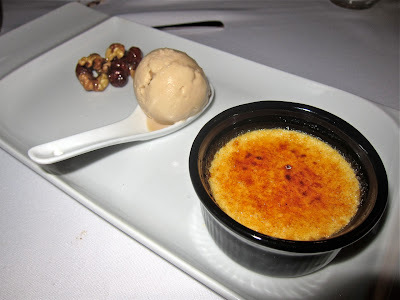 For dessert, I got the crème brûlée (158 CZK). The cream and caramelized sugar were as they should be. It came with a few nice candied nuts and salted caramel ice cream. Although I love salt and caramel, this version was not so good. The ice cream had large salt crystals sprinkled on top, so I got too much salinity in the first bites and not much toward the end. Strange and not so pleasant. The service this time was more friendly. But we also had a waitress who spoke almost no English and we had some confusion over the wine. At this price point, I'd expect fluent English. It's also worth noting that their website, as of this writing, is only in Czech. 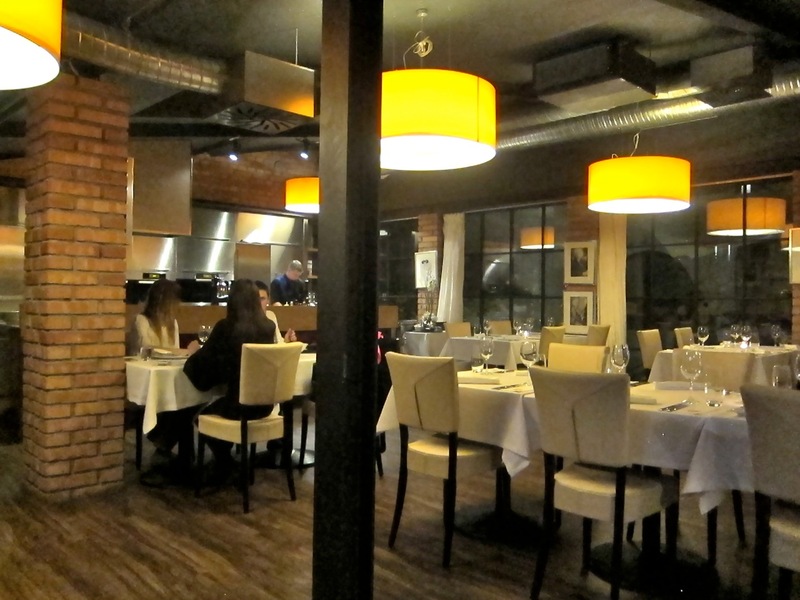 The bill for this celebratory extravaganza with champagne and the higher-priced dishes cost 3406 CZK before tip. There were great moments in each meal. But overall we enjoyed our first, less expensive visit more. I'll probably go back to Bílkova 13 again and try a few more dishes. The menu has some interesting choices. But it's right at the tipping point for me on my value scale. I'm hoping the next visit will continue to renew my interest.